In 1936, the crew of the British gunboat HMS Gnat lacked a mascot, and the captain and crew decided to remedy that situation before starting patrols on the Yangtze River. Their sister gunboats, the Bee, Cicada, and Cricket already had mascots of their own. 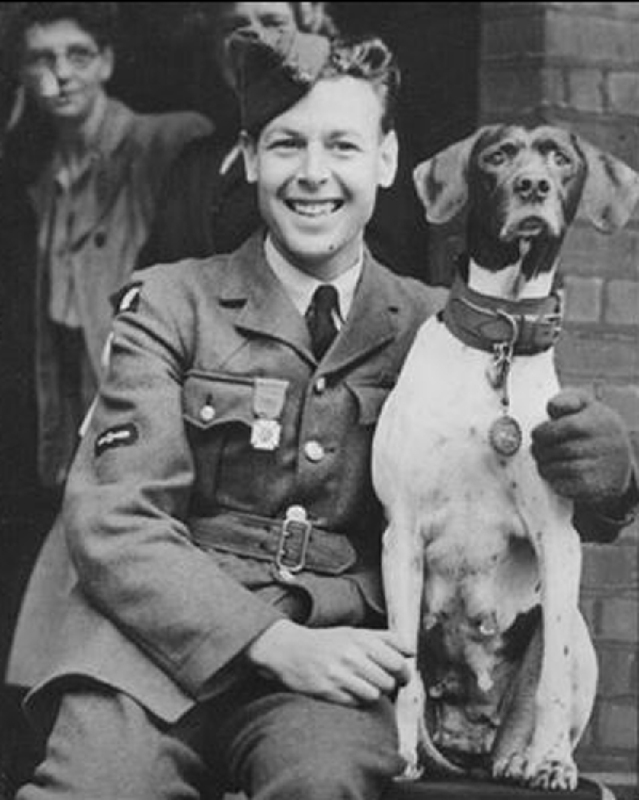 So Lieutenant Commander J. Waldergrave and Chief Petty Officer Charles Jefferey purchased an English Pointer puppy they named Judy from a kennel in Shanghai, China, intending for her to both serve as mascot and as a gundog for hunting when the crew went ashore. The ship’s cook, Jan “Tankey” Cooper, was assigned the responsibility of caring for her. Fast-forward to the start of WWII and the HMS Gnat was recalled to port where Judy joined the crew members who transferred to the HMS Grasshopper in June of 1939. Three years later, the Grasshopper was struck by a torpedo and the crew abandoned ship. Judy proved her worth when she joined the crew on an uninhabited island off of Sumatra. At first, the men were unable to find freshwater, but Judy’s sensitive nose led her to a point in the sand near the shoreline when the tide was low. She then began to dig until ultimately uncovering an underground freshwater spring, providing clean drinking water to herself and the survivors. A few days later, the crew managed to “commandeer” a Chinese junk and set off to Sumatra. Once there, they began a 200 mile trek to the British-held Pedang; Judy, of course, went with them. They hoped to arrive in time to join the British evacuation of the area, but they missed the final boat and instead walked right into a Japanese-controlled village on their way. Now captured, the bedraggled soldiers were transported to the Gloergoer POW camp. Not wanting to leave their mascot behind, the crewmen hid Judy beneath empty rice sacks during the journey. So one afternoon, he laid his entire ration of rice on the ground for Judy to eat. She wolfed it down before laying herself at his feet. From then on, she was his constant companion and the rest of the prisoners soon referred to her as his dog. Judy’s position at the camp was a treacherous one, however. She often interfered whenever the Japanese guards began beating a prisoner, snapping and growling at them, which just resulted in the guards focusing their attention, and aggression, on her. Needless to say, Williams and the other prisoners feared for Judy’s safety. They believed it was only a matter of time before the guards followed through on their frequent promises to kill the dog. So Williams came up with a plan. Knowing that the commander of the Gloergoer camp would often get drunk, and become quite friendly when he was in that state, Williams waited for such an occasion before approaching him and convincing the commandant to give Judy official POW status. He sealed the deal by offering the commander one of Judy’s puppies as a gift for his local mistress. The plan worked. Judy became the only official canine POW during World War II- Prisoner of War 81A Gloergoer, Medan. From there on out, while guards could, and did, still occasionally beat her when she interfered with them, they were reluctant to kill a POW. The Japanese transferred Williams and other members of the Grasshopper’s crew to Singapore in June of 1944. Before the move, Williams spent several days training Judy to stay completely silent and still inside a rice bag. In this way, Judy was again smuggled with them, lying in a rice bag for three hours while Williams stood with other prisoners on the deck of the SS Van Warwyck before they set off. Williams couldn’t fit through, but managed to find another way off the boat and then swam around looking for Judy for some time. He later recalled, “As far as the eye could see, the sea was filled with wreckage being dragged away by the fast currents. Somewhere in there, Judy was swimming.” After unsuccessfully being able to locate Judy, he eventually made it back to land, but was recaptured and sent to another prison camp. I couldn’t believe my eyes. As I entered the camp, a scraggy dog hit me square between the shoulders and knocked me over! … I’d never been so glad to see the old girl. And I think she felt the same! Williams and Judy managed to survive a backbreaking year in Sumatra before the war ended in 1945. Upon being released, however, another problem arose. The ship that was to carry them back to Britain, the S.S. Atenor, did not allow animals. Unwilling to leave her behind, Williams smuggled Judy aboard while a few other POWs distracted the guards. For magnificent courage and endurance in Japanese prison camps, which helped to maintain morale among her fellow prisoners and also for saving many lives through her intelligence and watchfulness. Judy spent the rest of her life with Williams and continued her globetrotting by traveling with him around Africa. She was ultimately “put to sleep” on February 17, 1950 at the age of 13 as her health had declined significantly due to a mammary tumor. Williams buried her in an RAF coat he’d made specially for her, as well as erected a small memorial in her honor. Brilliant story. What a brave and resourceful dog. Thanks Sarah. By the way, ‘Victoria’s Cross’ is actually called the Victoria Cross, often abbreviated to VC.